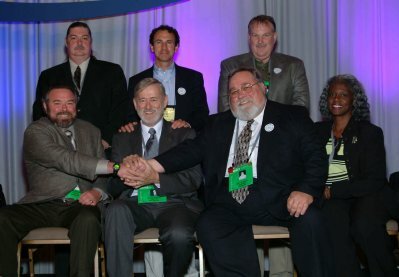 The Michigan Association of Governmental Employees (MAGE) was founded in December of 1980 to protect the rights and promote the interests of classified State of Michigan Employees in non-exclusively represented positions. We are an organization designed to serve those employees who are excluded from collective bargaining rights under the state's Employee Relations Policy. MAGE is affiliated with OPEIU as local 2002 (Office and Professional Employees International Union). Our policies are formulated at annual General Council meetings attended by delegates elected from districts throughout the state. Delegates vote on resolutions submitted by members or committees, and elect state officers and the board of directors. MAGE is divided into Districts for representation purposes, each administered by a District Director and Deputy Director elected by their district delegates to the General Council. The Executive Committee is elected by all General Council delegates. That committee, together with the District Directors makes up the Board of Directors which is responsible for managing the affairs of MAGE. Do you ever feel alone in attempting to protect your rights as a non-exclusively represented employee? In June of 1982 MAGE won meeting rights with departments for the first time. Since then, we have used those rights to protect employees adversely affected by departmental reorganizations, to guarantee equal promotional opportunities, and to protest staffing shortages and adverse working conditions. Want to join now? Click here to go to the application for membership. The MAGE Labor Relations Professionals are based in the Lansing office, but represent members state-wide. Members are represented at investigatory conferences, disciplinary conferences and all levels of grievance conferences, including mediation. When approved by the Board of Directors, lawsuits may be filed on behalf of members when appropriate. Click here to see more about the MAGE staff. Capitol Services, a highly respected lobbying firm provides MAGE with a voice in the legislature. They are busy watch-dogs, constantly analyzing and reporting the actions of the House and the Senate as well as those pesky Executive Orders passed down by our illustrious governor. Click here for recent legislative events and reports. Fraser, Trebilcock, Davis & Dunlop, P.C. is the law firm primarily retained to handle MAGE lawsuits. Attorneys Michael Cavanaugh and Brandon Zuk of the Fraser firm have litigated for MAGE with passion since MAGE was formed. MAGE committees are selected by the MAGE President and are comprised of your fellow MAGE members. These committees recommend courses of action on various issues to the MAGE Board of Directors. Click here to see the important people at MAGE page which details the committees. - call 1-800-477-6243 to receive your copy. We have now successfully culminated an agreement which will result in the transfer of all State of Michigan employee members of Local 512 to MAGE Local 2002. As of September 2004 MAGE will become 600 members stronger. MAGE Local 2002 President Dale Threehouse and Labor Relations Director John DeTizio met for two days with 512 officers, John Strachan and Aaron Sanders in the office of OPEIU President Michael Goodwin (pictured below) to work out the details of the agreement. President Goodwin said, "I am very pleased that the local unions were able to reach this historic agreement. A single local union representing public employees in Michigan will accelerate our organizing success. I look forward to working to grow the union."